Sunday marked Ellen and Eric’s wedding anniversary and quite a few of you may remember that wonderful gathering on a crisp October day 22 years ago. We’re blessed these days with bright and sunny weather that brings beautiful light and color into their home and offers lovely sights out the windows – soaring birds, deciduous trees tipped with bright colors, happily grazing sheep, horses, and white-tailed deer. For days Ellen was restless, touring around the upstairs of the house, going from place to place in the wheelchair (with help) and moving items here and there, sometimes with an evident purpose and sometimes not. At one point earlier this week, she was on the go for 22 straight hours before finally falling into a deep sleep. Since then, she’s still driven to be on the move – she’s been spending quite a bit of time packing her bags – but with a bit calmer pace now and much more rest and sleep in between. Whew, say the primary caregivers (husband Eric, mom Kathryn, sister Anne, and friends Anne and Shivani). While it seems Ellen’s arms and legs are staying relatively strong for all that restless activity, we’ve noticed other changes in the past week, notably Ellen has more discomfort, more confusion, increasing difficulty swallowing, and more labored breathing. Working with the hospice nurse, who’s checking in daily, we’ve responded by moving away from medication in the form of pills and offering more liquid pain medication and temporary boosts of oxygen. 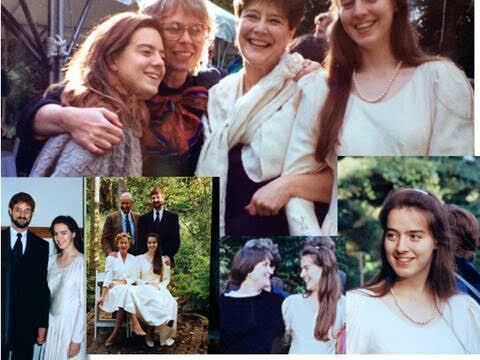 Here are sweet photos from Ellen and Eric’s wedding day in 1994. It was a beautiful wedding and a very happy day. I remember thinking that Ellen and Eric both looked like they were glowing. Thank you so much for the continuing gift of these postings. Ellen is so lucky to be accompanied at this time by such extraordinary people. Sending love to all of you.